Happy Birthday, Spirit of David I. Hill: My “Hero” Forever! Since medieval times, March 25th has been known as Lady Day. The name comes from the medieval Church’s celebration of the Annunciation, which many Christians traditionally have believed was the moment the archangel Gabriel announced to the Virgin Mary that she would bear a son. My beloved David’s mom was raised Catholic. No surprise he frequently mentioned, in our early years together, that he was born on Lady Day. I was a “late firecracker” born one day after the Fourth of July. 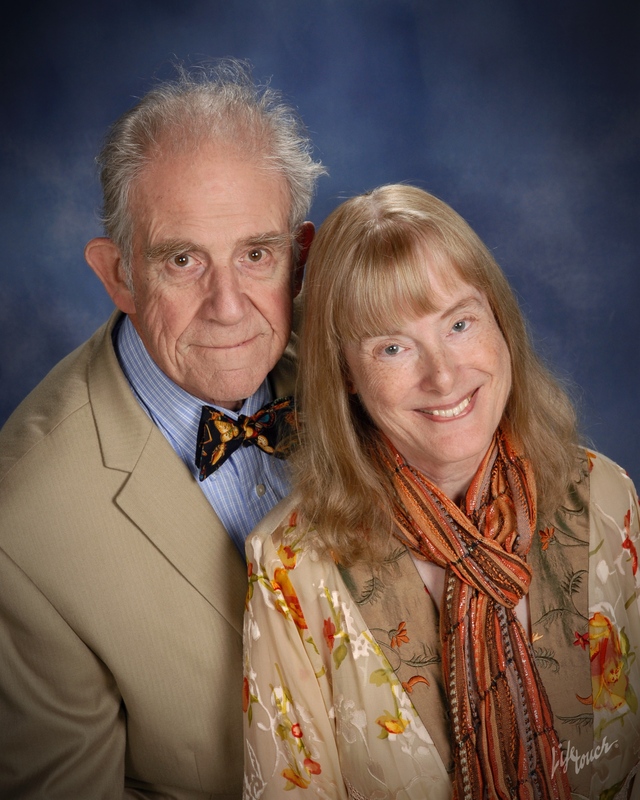 Belated independence and mutual dependency merged when this lady in love married her “hero.” David and I made a fantastic combination in so many ways. He would have been 88 years old this month. HAPPY BIRTHDAY, DAVID! We shared a wild ride together. Do you remember when sons David, Jim and John threw Minute Rice at our wedding in Mariposa, California, in 1975? We’d only told them about our plans the night before. Remember when our daughter, Alicia, was born and the staff at Kaiser Hospital thought you were the grandfather? And remember when I got your wheelchair stuck on that railroad track a few years ago, and we heard the horn of an approaching diesel train? 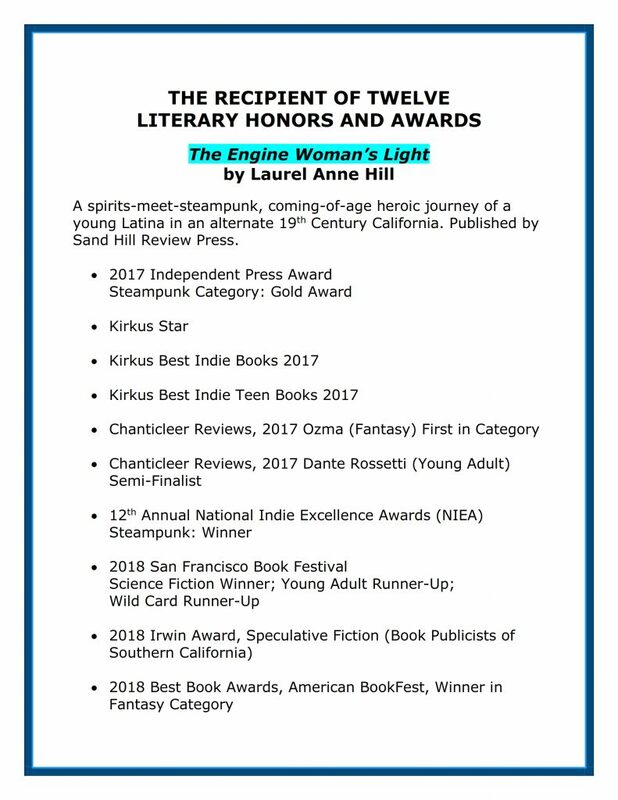 And how the hovering shadow of your death from cancer didn’t keep you from finding typos in my soon-to-be released novel, “The Engine Woman’s Light?” Sand Hill Review Press did the last-minute corrections just in time, thanks to you. We will be together again, my love, hopefully well AFTER I get my next novel published, another story we worked on together. I feel compelled to see that one in print. I hope 2019 will be a good year for you. 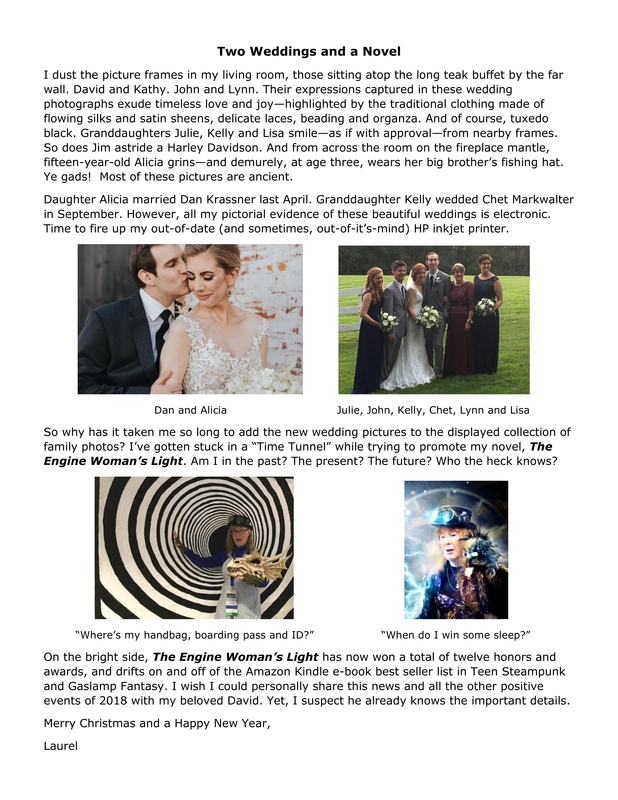 “The Engine Woman’s Light” and I made the “Swimsuit Edition” of the Hollywood Weekly in July. Click on this Link to Hollywood Weekly July 2018 Then turn to the last page. 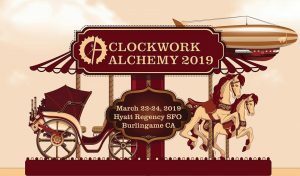 Nice press release featuring Black Chateau authors attending WorldCon 2018. Click on this Link to Black Chateau Press Release. 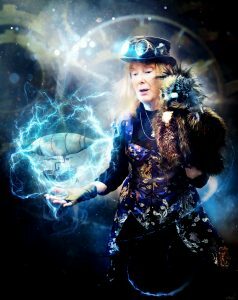 I’ve just returned from SpoCon in Washington State, and am packing to head for WorldCon in San Jose, CA, which starts tomorrow. I seem to be in this whirlwind, where I don’t even have time to snap a photo. 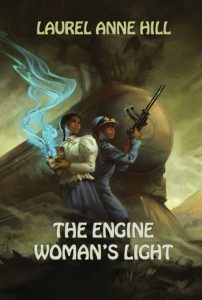 I’ll be selling books (including “The Engine Woman’s Light” ) on consignment at the Silicon Valley Writers table in the WorldCon Dealers’ Room. “The Engine Woman’s Light” will also be available at the Greater Los Angeles Writers Society (GLAWS)/Black Chateau Enterprises table, and possibly at the Borderlands Books table, as well. 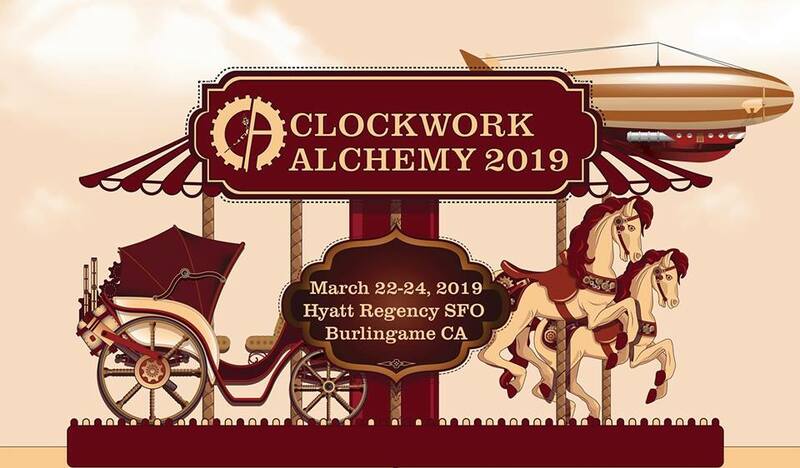 My scheduled signing at the GLAWS table is 4-6 pm on Saturday, August 18, after a quick trip to Redwood City to give a presentation to CWC San Francisco Peninsula Writers. Well, my time for website update is UP. Back to the whirlwind.